The Recording Custom Brass Snare Drum from Yamaha was designed in collaboration with legendary drummer and Yamaha artist Steve Gadd to reintroduce their recording custom series with modern technology and the latest advancements for optimizing its sound. Possessing precision-machined lug nuts, Remo heads, Q type and DC3 type strainers and an outward center bead, Yamaha's Recording Custom Snare Drum is an excellent addition to any drummer wanting to fully utilize their recording custom drum kit. 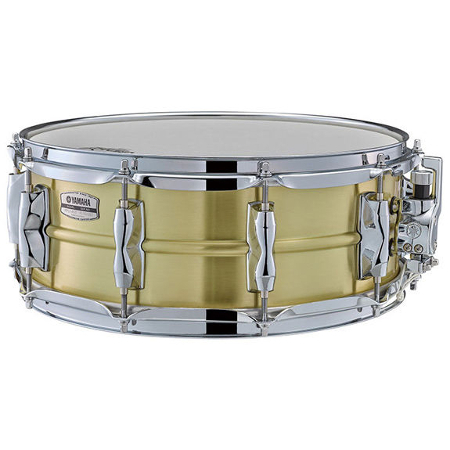 The recording custom snare drum is constructed out of brass for its shell in order to deliver a tone that has plenty of power which allows it to cut through any mix. The brass offers similar tones to other metal shells, producing a crisp sound that has a clear rimshot that can cut through loud music with ease and offers a good low end punch, but also features a warmth to it that you would normally only get from wooden shells. The combination between the snares weight and cutting attack makes it excellent for heavy rock and metal, as well as music that requires definition. Yamaha's recording custom snare drum features a one-piece lug nut that has been precision-machined to provide a noise-free control and allow for a high tension with the snare wires to add some weight in order to enhance the snares subtle low frequencies and offer great sensitivity and dynamics. The snare also possesses an outward centre bead to give the drum even more open sounds and excellent articulations, along with a Q type strainer to add some robustness to the drum and keep it all stable, with the ability to make any adjustments or replacements.